In a previous article, I discussed how dividend investors should analyze the earnings of each company they own in detail, in order to obtain an understanding behind the real valuation behind the business. I discussed how AT&T (T) and Coca-Cola (KO) appeared cheaper than usual. Today, I will discuss another example of a situation, where I had to dig deeper, before obtaining the full picture behind Abbott Lab’s valuation. I have been a shareholder of Abbott Labs (ABT) for many years. Just like many other investors, I am cheerful about the announced split in two separate publicly traded companies, which will unlock shareholder value. I am also optimistic about the prospects of each of the separate divisions to continue increasing shareholder wealth by continuing the culture of boosting dividends. Abbott Labs is a dividend aristocrat, and has managed to boost distributions every year for 40 years in a row. As I discussed earlier, I initiate or add to my positions in two or three dividend stocks every month. As part of my process of screening for attractively valued stocks each month, I noticed that a few good companies were not part of my buy listing. I was expecting to add to my existing position in Abbott within a few months. This inconsistency startled me, since in my recent analysis of the stock, I had concluded that it was still a great buy. I glanced at the company’s profile in Yahoo Finance and Google Finance, only to see that it was trading at 20 times earnings. Yahoo and Google Finance sites are currently showing $3 in earnings per share for the company. Given the current dividend payout of $2.04/share, this makes the payout ratio to be a very high at 68%. This is consistent with a public utility, but not with a dividend growth company such as Abbott Laboratories. Diluted earnings per share, excluding specified items, were $1.18, at the high end of Abbott's previous guidance range, reflecting 12.4 percent growth. Diluted earnings per share under Generally Accepted Accounting Principles (GAAP) were $0.19, net of specified items, including a $1.5 billion pre-tax reserve related to previously disclosed litigation. 2011 Net Earnings Excluding Specified Items excludes after-tax charges of $1.4 billion, or $0.92 per share, related to litigation reserves (see Footnote 3 above), $75 million, or $0.05 per share, associated with the acquisition of Solvay Pharmaceuticals and $78 million, or $0.05 per share, for previously announced cost reduction initiatives and other. These items were partially offset by a favorable adjustment to tax expense of $51 million, or $0.03 per share, as a result of the resolution of various prior years' international and U.S. tax positions. In my analysis of earnings and dividend payout ratios, I tend to focus on income from continuing operations. I exclude one-time events, in order to focus on recurring profits and normalize earnings per share. After reading this news release, investors would notice that these one time non cash charges accounted for 99 cents/share. 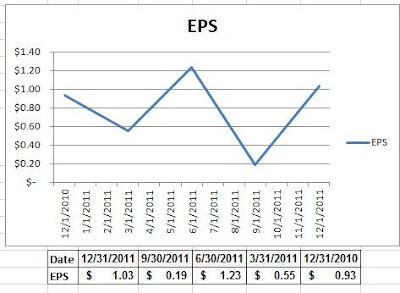 By adding them to EPS from continuing operations of 19 cents/share, we come up with $1.18/share in actual earnings. This brings the total earnings per share for the past four quarters to $3.99/share. As a result of this adjustment, the price earnings multiple decreases from 20 to 15.